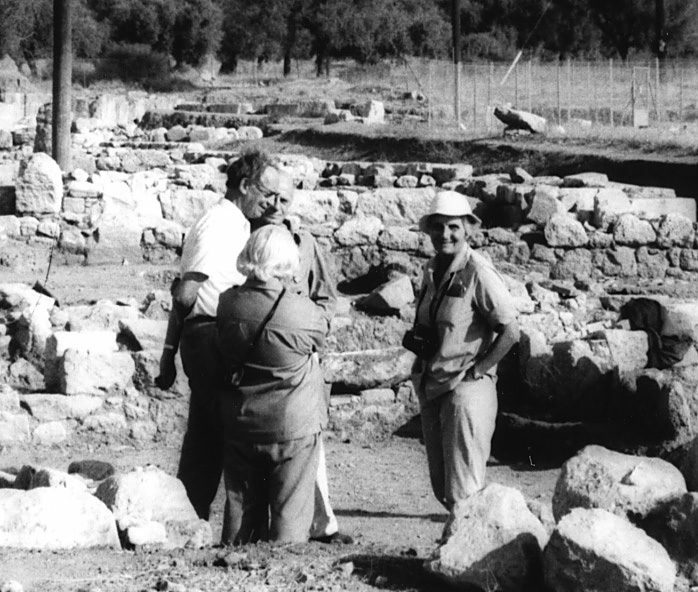 Swiss archaeologists started to work in Eretria in April 1964, but on the initiative of Ioannis Papadimitriou, the Greek Archaeological Council had already accepted the principle of Swiss participation directed by Karl Schefold in the excavation and study of the ruins of Eretria in 1962. Vasilis Petrakos, who was then the epimelete in charge of Eretria, had drawn the attention of the Greek archaeological authorities to the threat to Eretria’s ancient remains posed by the development of the small modern town. In fact, no other foreign archaeological team had been involved in studying the site since 1895, when the American School completed its work. In 1975, after the end of the rule of the military junta (1967-1974), the Swiss Mission requested and received the title, habitual in Greece, of “School of Archaeology “. A few milestones: Swiss archaeological excavations in Eretria can be divided into four phases. The first phase, from 1964 until 1982, is that of the great discoveries: Paul Auberson studied the buildings predating the 7th and 6th c. BC Doric temples of Apollo Daphnephoros; Claude Bérard uncovered the rich necropolis from the Geometric Period (Heroon) as well buildings predating the Archaic temple of Apollo; Antoinette Charon excavated the Sacrificial Area North of the sanctuary of Apollo; Clemens Krause unearthed the 7th c. BC canal of the western river, the 6th c. BC West Gate and fortification as well as the 6th and 4th c. BC Eastern Stoa in the agora; Lilly Kahil dug up the remains of Geometric houses near the harbour; Pierre Ducrey and Christiane Dunant revealed the sumptuous dwellings of the Classical-Hellenistic Period, including the House of the Mosaics. The plan of the modern town of Eretria was also subject to global studies: a project by a team from the Swiss Federal Institute of Technology in Zurich was intended to preserve the 19th c. architectural heritage and a topographical grid was measured by Rudolf Glutz, which is still used as a reference in the excavations. The second phase, from 1983 to 1995, is a period of consolidation, with limited fieldwork and a focus on the study of previously excavated finds and data. The acropolis was surveyed by Pascal Friedemann, Karl Reber excavated House IV in the West Quarter, Elena Mango conducted exploratory trenches in the Gymnasium. The third phase, from 1996 to 2014, is marked by a new spurt of excavation activity to explore the Roman town center, which led to the discovery of the Sebasteion by Stephan G. Schmid and of public Baths. A growing interest in the wider setting of the ancient city also yielded significant results with the study of the civic organization of Eretria’s territory and the exploitation of its resources by Denis Knoepfler and Sylvian Fachard. Several old excavations were also published by a generation of young archaeologists, such as the North sacrificial area by Sandrine Huber, the Sanctuary of Apollo by Samuel Verdan, the Heroon burials by Béatrice Blandin, The Macedonian tombs by Caroline Huguenot. The fourth and ongoing phase represents a major turning point, with the groundbreaking discovery of the Sanctuary of Artemis in Amarynthos. Thanks to the enduring research of Denis Knoepfler, a project of the Swiss School in collaboration with the Greek Ephorate and Antiquities in Euboea has been underway since 2004 to locate the sanctuary. Field surveys, geophysical prospection, geological boreholes and archaeological excavations have already brought to light a complex of several monumental buildings. A decade later, conclusive evidence was obtained for the identification of this complex as belonging to the sanctuary of Artemis Amarysia: a series of terracotta tiles stamped with the name of the goddess as well as several stone inscriptions bearing the name of the triad, Artemis, Apollo and Leto. Fieldwork and material study in Eretria are actively undergoing, with excavations in the Gymnasium and the Palestra (2015-2018), as well as a comprehensive program of analysis of the local pottery. The School preserves and maintains the archaeological remains it excavates, such as the houses of the West Quarter, the Temple of Apollo or the Sebasteion. It has conceived, financed and carried out the expansion of the Archaeological Museum of Eretria, as well as the construction of a pavilion to protect and display the mosaics of the House of the Mosaics (1987-1991). The discovery of an exceptional set of pebble mosaics from the 4th century BC, in perfect condition, raised from the outset a question of principle: could one preserve these precious mosaics on site, or did they have to be taken up and moved to the Museum? The first solution was selected, thanks to the support of generous patrons, Heidi and Hellmut Baumann, who took a passionate interest in the House of the Mosaics and agreed to pay for the restoration of the mosaics, and then for the design and construction of the pavilion. After much consideration and many consultations, the Greek archaeological authorities decided on the construction of a modern pavilion on the foundations provided by the ancient walls. It was important that the pavilion could withstand an earthquake and that it fit in well with the structures surrounding it. White walls surmounted by wooden beams and a tile roof were chosen. Drainage is provided by copper flumes. Large windows with unbreakable panes allow a good view of the mosaics while at the same time protecting them from vandalism. 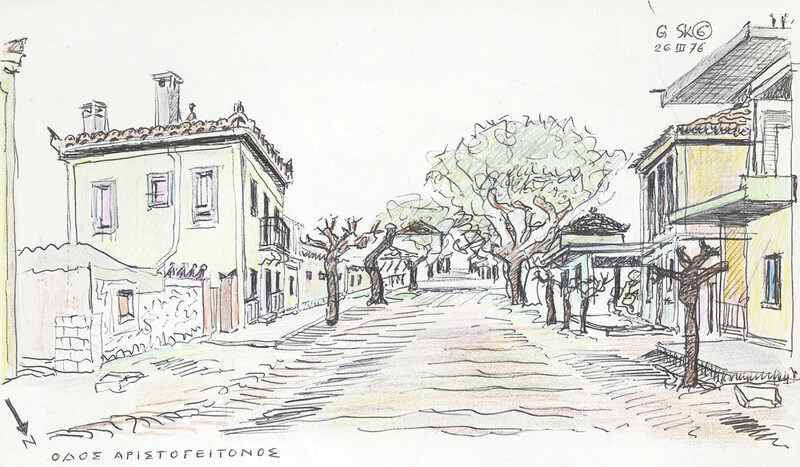 From the outset, the School has taken an interest in the origins of the modern town of Eretria. In 1974‒75, a team from the Swiss Federal Institute of Technology in Zurich drew up a map showing numerous 19th-century houses and proposed that they be preserved. A project was submitted to municipal and governmental authorities, and then presented in two exhibitions, one in Eretria, the other in Athens. The creation of an archaeological zone in the region between the Temple of Apollo Daphnephoros and the House of the Mosaics, which constituted an important part of the 1975 project, has sporadically inspired interest. In 1998, the Swiss School gave a new impulse to studies on modern and contemporary Eretria that led to the publication of two books by Ferdinand Pajor. 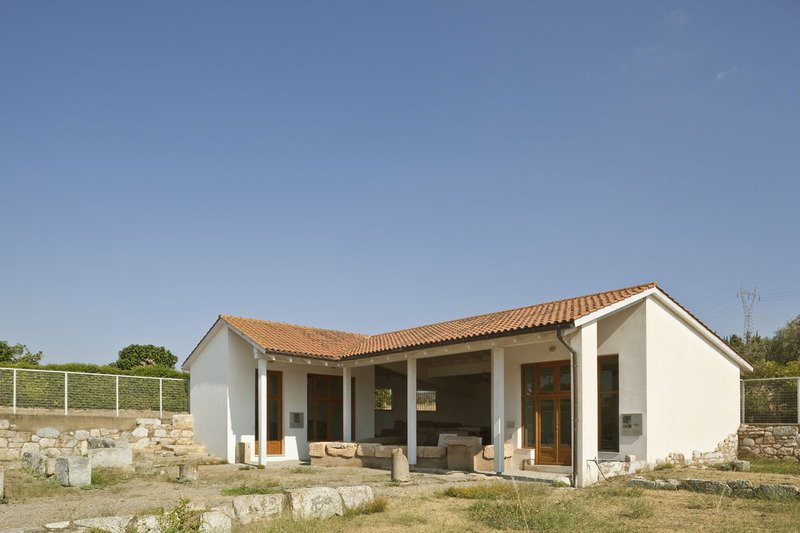 In terms of specific accomplishments, the School has restored a 19th-century house that belonged to Admiral Nikodimos, one of the heroes of the Greek War of Independence, and also established its excavation house in Eretria.